The American Society of Genealogists (ASG) was founded on 28 December 1940 in New York City as an independent society of leading published scholars in the field of American genealogy. An honorary society, ASG is limited to fifty lifetime members designated as Fellows, who may use the initials FASG (see the ASG website, fasg.org, for lists of Fellows past and present). In 1940 nothing existed to honor significant achievement in the field of genealogy or to identify competent genealogists. The three founders of ASG – Arthur Adams, John Insley Coddington, and Meredith B. Colket, Jr. – wanted to change that situation. 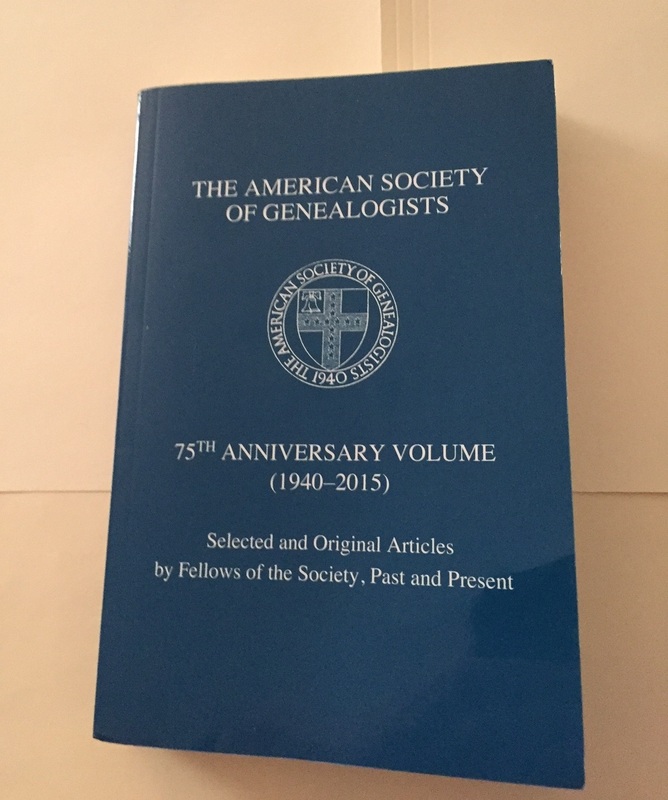 From the outset, ASG was (and still is) dedicated to (1) advancing genealogical research methods and encouraging publication of the results, and (2) securing recognition of genealogy as a serious subject of research in the historical and social science fields of learning. Significant ASG contributions to genealogy have included a key role in establishing the National Institute on Genealogical Research (1950) and later national, state, and local institutes and seminars; publication of Genealogical Research: Methods and Sources (1960–1983); creation of the Certificate of Appreciation for notable contributions to genealogy (1961); creation of the Board for Certification of Genealogists (1964); creation of the Donald Lines Jacobus Award to encourage sound scholarship in genealogical writing (1972); and creation of the ASG Scholar Award of $1,000 towards attendance at one of five major genealogical institutes in the U.S. (1996). In 1996 ASG accepted ownership of The Genealogist (founded in 1980 by Neil D. Thompson), which has continued as one of the leading scholarly genealogical journals. In addition, from its inception ASG has fought attempts to delude the public for profit by misusing genealogy or heraldry. To mark its anniversary, ASG has just published The American Society of Genealogists 75th Anniversary Volume (1940–2015): Selected and Original Articles by Fellows of the Society, Past and Present (a copy is in the NEHGS Library, with ordering information on the title verso page). The volume contains thirteen new articles (mostly on New England and New York families) by Frederick C. Hart Jr., Gale Ion Harris, David Kendall Martin, Ronald A. Hill, John Bradley Arthaud, Patricia Law Hatcher, Melinde Lutz Byrne, Harry Macy Jr., Jane Fletcher Fiske, John Blythe Dobson, Myrtle Stevens Hyde, and the undersigned, along with nineteen reprinted articles from leading journals (including the Register). Researchers will want to review this volume, not only for the new articles but also for the reprinted articles that may bring some new insight. I have exchanged e-mails with Fellow David Kendall Martin. Great guy, fountain of knowledge & easy to contact & converse with. My vote goes to Harry Macy, Jr – who has always taken the time to write to me, to answer my questions, but mostly for always treating myself and my research with more respect than it or me could possibly deserve. P.S. – And that “fellow” Mr. Hoff – is a pretty darn good sort himself!